Publication or other use of images or descriptive text on these pages is unauthorised unless written permission is obtained from the author and publisher. 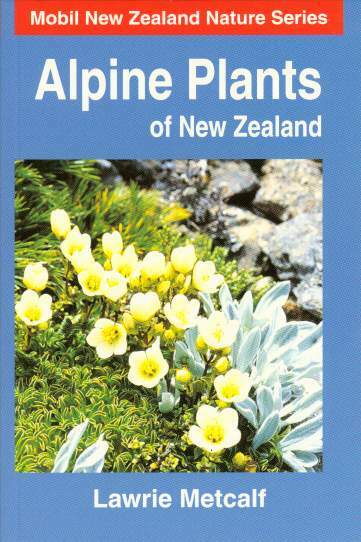 Appropriate acknowledgement of the publication Alpine Plants of New Zealand must always be given. This species varies from a robust herb 50-60 cm tall, to a smaller tufted plant no more than 10 cm or so tall. Leaves: Heart- or kidney-shaped, thick and leathery with brown hairs fringing their toothed margins. On the larger forms they are 15-22 cm in diameter, while on small forms they may be no more than 2-4 cm in diameter. Flowers: The flowering stem is branched (may be unbranched and with only a single flower in small forms) and carries numerous bright yellow flowers, 2-5 cm in diameter. Usually five to seven petals, but may be up to 12 on plants in some areas of Marlborough. 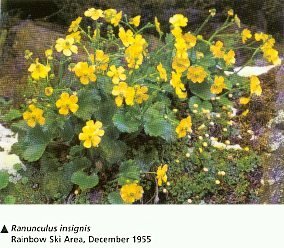 Occurs in shady areas of grassland, herbfield, subalpine shrubland, on sheltered bluffs and rock outcrops. Identification: With its bold, green leaves and bright yellow flowers it is a handsome and easily recognised species, although, as currently understood, the species is an amalgam of several forms ranging from the larger plants, commonly regarded as R. insignis, to smaller plants formerly regarded as distinct species. The smallest forms generally occur in the southern part of its range.